Rising Strong – My Voice. My Vision. Today is the day! Brené Brown’s new book, “Rising Strong” hit the shelves! And not only that, but for the first time she is narrating the audio book! I am not a fiction reader but I love autobiographies. Like Brené, I love people’s stories. So when audio books are released with the author narrating I get unusually excited. Dr. Brown’s work is only semi-autobiographical, as she reflects on the way her work is reflected in her personal life, but her work is highly personal and her candor can’t be beat so I am really looking forward to reading along with her narration. I’ve not been feeling particularly strong or resilient lately so today’s release has been a long time coming. 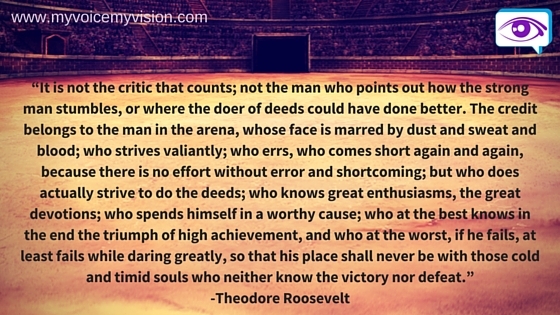 If you have read Brené Brown’s work or heard her speak she will often quote the Theodore Roosevelt quote: This quote provided the title for her last book, “Daring Greatly”, which I am just finishing up. We begin “Rising Strong” with this quote again. But immediately she tells us that we are focusing on just part of the quote this time, “The credit belongs to the man in the arena, whose face is marred by dust and sweat and blood.” This is where our story begins. And in “Rising Strong” we take a look into Dr. Brown’s research to discover what it is that gets the Wholehearted back up off the ground after they have dared greatly and failed. What keeps them going? What keeps US going? I have been numbed by fear and exhaustion for the last 5 days. On October 9, I will go before our family court judge for the 8th time in two and a half years. Two summers ago I spent several months in the midst of a best interest forensic evaluation. The doctor who presided over the evaluation was paid by my ex-husband, ignored the history of abusive behaviors, the psychological assessments, and recommended to the Court that we share legal custody and that my son spend ample, unsupervised time with his father, while letting me retain residential custodianship. This man, this “expert”, did not look at the evidence. This man did not look out for the best interests of a then two-year-old boy but instead provided a heavily biased report that changed the trajectory of my life, attempted to sever the secure attachment between Aidan and I, and which repeatedly puts a now four-year-old boy in grave danger. Now Aidan’s father wants the same “expert” to do another evaluation to prove that I am unfit to parent our son. I am tired. For the last three years I have been writing court documents and searching through family law rules and precedent on my own. I’ve never had the luxury of an attorney when I’ve filed a motion or answered a motion. I am in the arena. I live in the arena. I have dared greatly and I have erred greatly. I am certain that with a half decent attorney by my side we could have gotten out of this mess mostly intact, but we don’t have the ability to pay someone else to jump in the mud for us. So I am dirty, I’m worn down and it feels like I’ve yet to get off my knees from the last time I laid face first in the dirt before a judge. I’ve striven to do the deeds for a very worthy cause: my devotion to my son. I’m going to keep swinging because I have no other choice. Until the defeat is eternal I know I’m not done. Right now I am getting very pleasant emails. Aidan says his dad is being “really nice” and he has a new girlfriend who is spending a lot time with Aidan. I don’t know her but I am grateful for her presence because I assume with her around XN is on his best behavior. I also fear her because she is likely being used only to provide witness to the wonderful father XN is (with the camera on) and will be dropped and gone as soon as it’s over. Right now Aidan isn’t afraid to go to his dad’s house which makes it a little easier. But knowing that this is all for show and that Aidan could tell a hired hand he’d rather live with his father than with us is terrifying. Yesterday my son told me that I don’t love him, that I’m always wrong, and I had the door slammed in my face for simply setting normal boundaries, giving guidance and discipline. It feels like I have to make the decision to either be a good parent now or to be a lesser parent that lets Aidan do as he wishes and have what he wants just so I can have the opportunity to parent at all next year. It is a horrible place to be. Parenting in fishbowl is not easy. Spending the little time I have reserved for play and rest to prepare for another lengthy evaluation is not at the top of anyone’s list for self-care and certainly not mine. As I watched Aidan playing soccer with my husband this morning I felt joy, and it was quickly wiped out by fear. Letting go of fear is nearly impossible right now and crawling into a hole and hoping it will best sounds like the best option. What are the real choices though? Rising strong is my only choice if I don’t want to lose my son. Read more about my journey back from shame with Brené Brown.